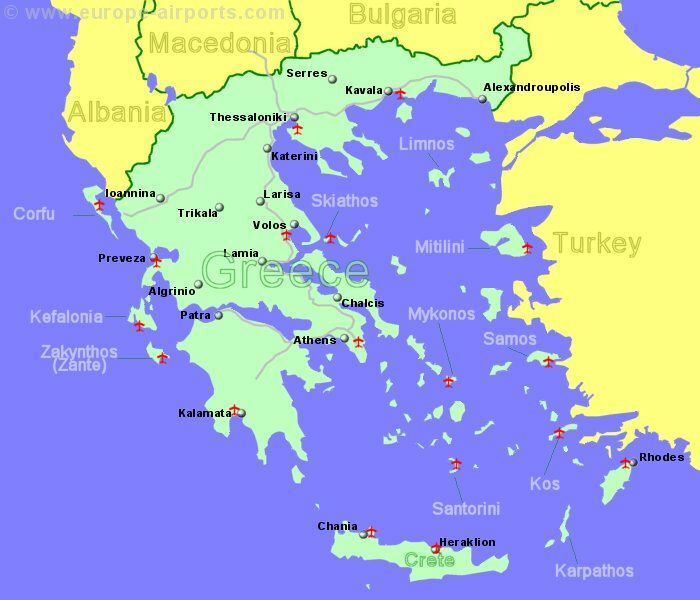 Greece has a mountainous mainland on the southern edge of the Balkan Peninsula, with the Peloponnese peninsula on the southern tip of that, plus a large number of islands, reaching south to Crete and east, near to the shores of Turkey. Much of Greece is a favourite holiday destination, offering picturesque beaches and centuries of history (the earliest advanced civilisations of Europe were here). 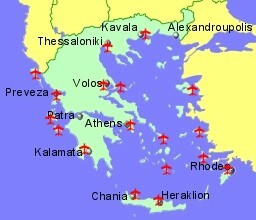 Greece has many small international airports, often on small islands, and the facilites are often considered to be limited for the number of passengers in peak holiday periods. Greece is a member of the European Union and the currency is the Euro. Greece is also a Schengen country. Located 3Km from Corfu city (Kerkyra), on the east coast of Corfu Island,the most northerly of the Ionian islands, north west Greece. Located 9 Km west of Argostoli, the capital of Kefalonia Island, the largest of the Ionian islands, western Greece. Located 6Km south east of Mitilini, on the south east coast of the Aegean island of Lesvos, eastern Greece. Located 4Km south east of Mykonos, on the central Aegean island of Mykonos, Greece. Located 6 Km south of Zakynthos town, on the south east coast of the Ionian island of Zakynthos, western Greece.